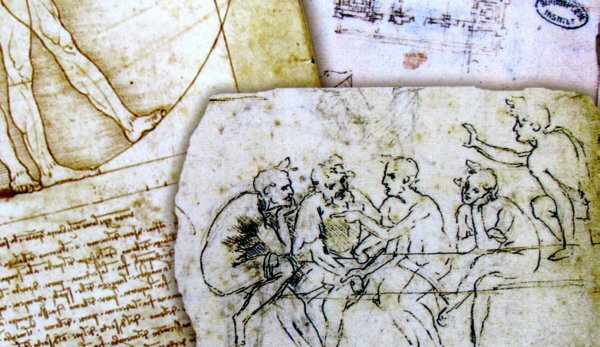 If Leonardo were alive today, our world would certainly be completely different place. Maybe better, maybe worse, but certainly full of inventions, we never dreamed of. With his imagination, this man would have become our gate to space. And who knows, maybe another such Leonardo was born between us. Hopefully, he will not spend his time playing computer games and shows his talent in a timely manner. 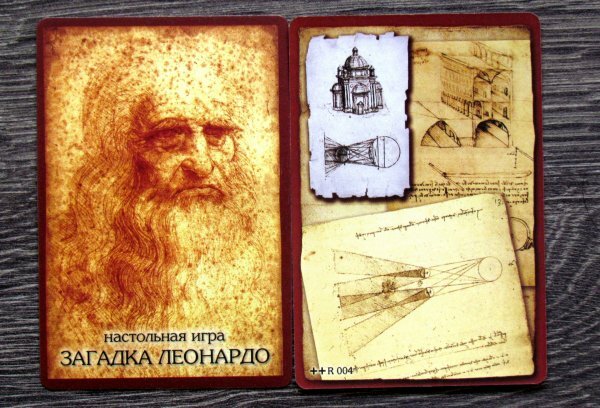 Yet, we can at least remember Leonardo da Vinci in the board game of Russian Board Games, which was created by Sergey Machin and Alexey Pahomov. Their work was published in 2011, but it got on our table only now. But it does not matter. Main thing is, that we are able to share our impressions with you, our readers. We will start as usual with unpacking. Box acts like a drawer, into which you insert a cardboard tray. 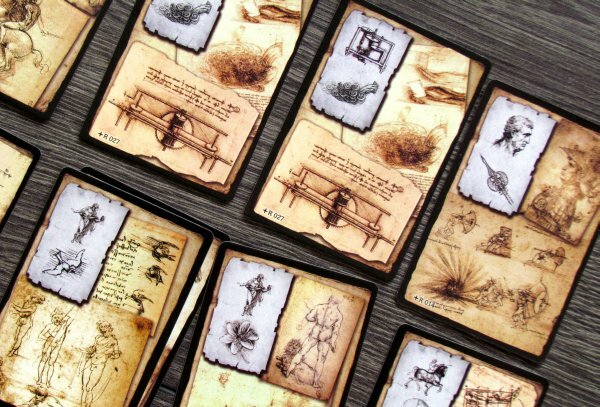 And while on the lid are clearly images, that will remind us of Leonardo da Vinci, inside are waiting for us even more pictures and a rulebook. Together, bottom drawer contains over a hundred cards. Thus, its not quite true, because only 67 of them have true dimensions. 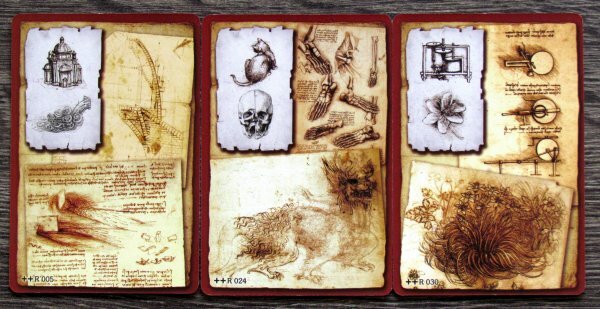 These cards are wearing illustration, that seemed to emerge from Leonardo´s pen. 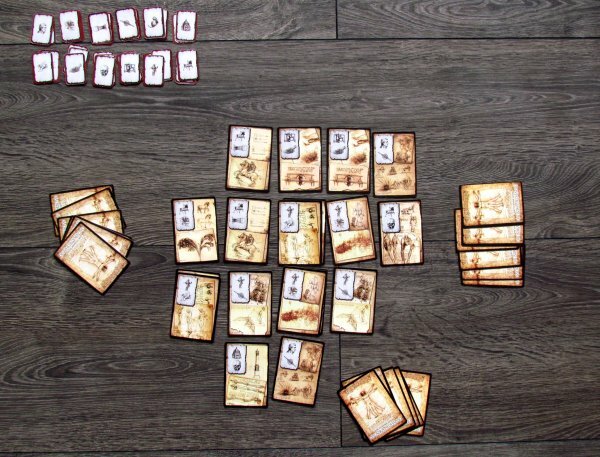 In the upper left corner, players will find symbols, that will connect in groups of two or three. Remaining 36 pieces are small cards, which need to be punched out from a sheet, but which are made of relatively soft paper. 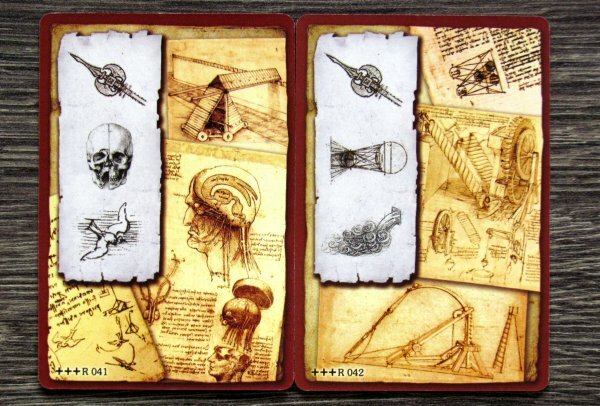 Such pieces represent secret keys and are wearing always one image (same as you find on those cards). Components are finished off with a green stone used as a veto token. 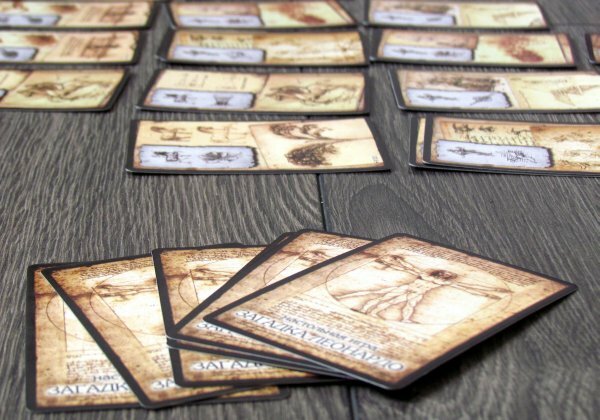 At the beginning of the game, players really shuffl deck of larger cards. Each participant gets six of them into his hand. Rest of the cards as well as keys cards, create drawing pile on the table. Game can begin and players take turns. Their job is simply to play a card from hand and put it on the table. By doing that, all builders gradually together produce square measuring five by five cards. New image can always be attached only as a neighborhood of already played cards, so final shape first emerges only partially. And yet there is one restriction, because player may not use any of the symbols, which was on card player by last player (player marks his card with a veto token, which shifts from card to card). 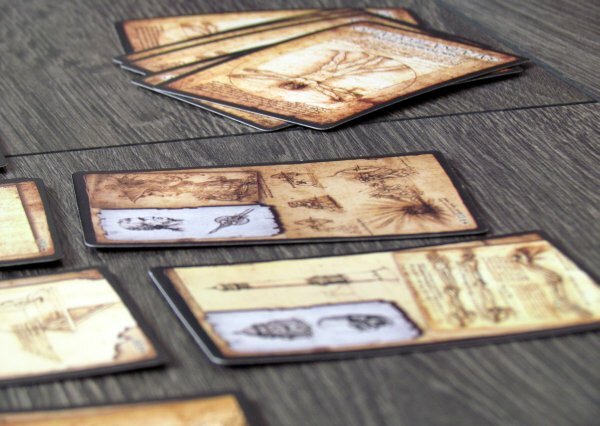 Newly-played cards can also overlay one of the cards already placed. Then, active player draws back to six and game continues with next participant in the sequence. 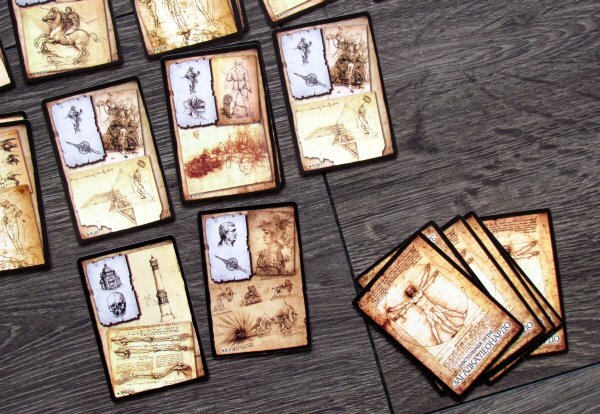 In case, that players managed to build a line of cards in some group of symbols, whether in horizontal or vertical direction, he can grab reward in the form of keys with same image. 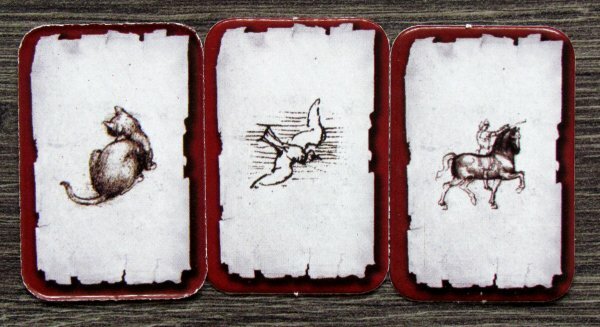 To achieve first key, player needs to create row of three cards. 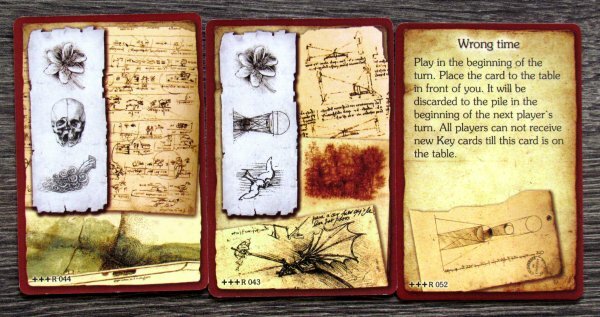 Player to capture second key of one type needs series of four cards and last specimen of its kind already needs five picture line for completion. 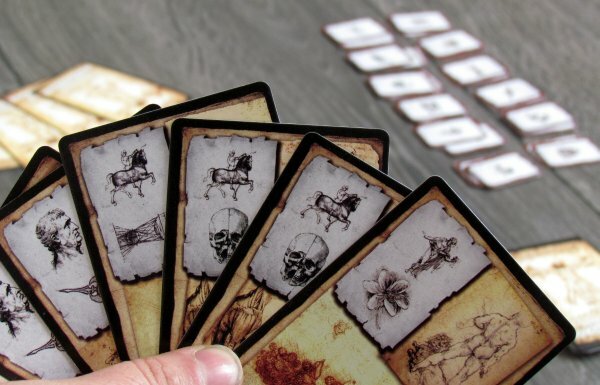 Duel and chase for key ends, when one player accumulates seven keys. In a balanced match, it may happen, that cards run out before anybody reaches this target number. In this case, winner is the one, who has most keys in his possession. The Enigma of Leonardo is actually such a disguised Tic Tac Toe. While adding a set of images, that need to be combined in lines, it otherwise offers actually same simple mechanic. But because players no marks of their own, one match can host multiple adversaries. Now this is that place, where this game starts to look very interesting. Still, it has a very basic gameplay. First problem of the game is the fact, that repeated games are always very similar. But this is true about most abstract games. And Quintis Fontis falls into this category, although it tries to defend against it with usage of cards. Theme itself is actually unnecessary here, because in addition to illustrations, it makes no sense. Most interesting in this game is ability to use pairs of symbols to create rows. Demands on their compleiton gradually increase as each new key is more expensive, than the previous one. It is not so easy to put together a series to get a reward. Here, however, depends not only on the capabilities of the individual player, but also on what other players are going for. Success has player in his hands. So in addition to declaration about abstraction, we are all interested in those classical parameters. Thus, when it comes to game time, its surprisingly long for such simple rules. Half hour is such a sensible minimum. And its all because of playing symbols and orientation is not easy. Although there are different objects, style is very similar and is not easy to keep track of them from a distance. How much better would this system be with a little colors. Conversely, gameplay works similarly in all the numbers. Graphics are chaotic and not adding to the clarity of the plan. Cards are thin and difficult to handle. However, biggest issue are the rules, that have been left unsaid and some other parts are again written in very bad English. The Enigma of Leonardo comes with an interesting idea using the classic original game gomoku. Unfortunately, it also brings with it unnecessary additional stones of shortcomings, which pull it down and make it impossible to be a good game. The Enigma of Leonardo: Quintis Fontis contains simply too many mistakes to make its hypothesis confirmed by entertainment. 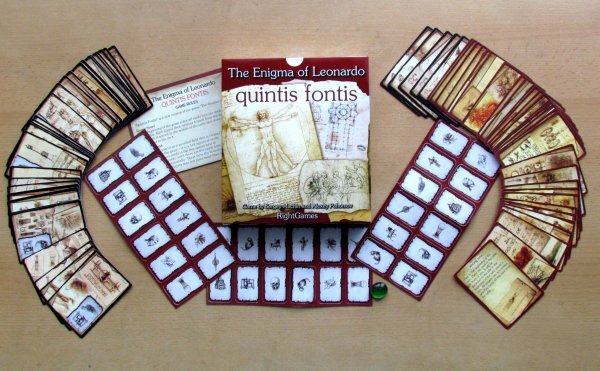 The Enigma of Leonardo: Quintis Fontis is a game, in which players create a table full of cards with five rows and columns. While doing that, they are trying to create a continuous series of images. But you can not extend the same, because player is always limited in selection of feature symbols against those, which were played in turn before his own. So far, it looks simple and thoughtful, but rules are not easy to understand properly. 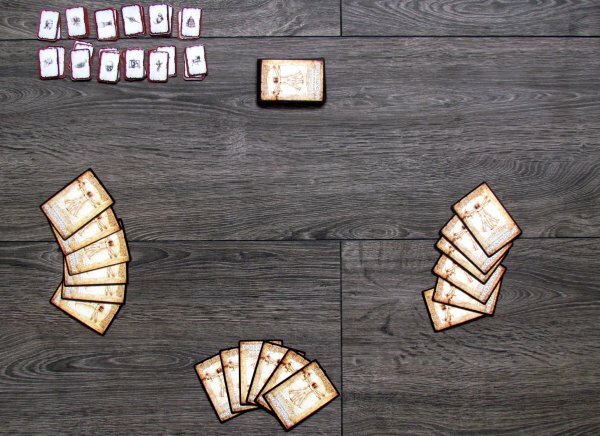 Additionally, theme for the game is pointless and is responsible for confusing card graphics. Length is also not ideal, even when match works with all numbers. The Enigma of Leonardo: Quintis Fontis is not a game, which would Leonardo da Vinci undersign.